Having delved and fought, the party withdrew, replaced a Ranger with a Fighter, and then re-entered the following day. This time, the rogue approached silently and well, and managed to get the drop on the two kobolds who had brought their mastiffs to guard the entrance after the demise of the guardian hobgoblins the previous day. The party stacked in the entrance, and then the rogue kicked off the festivities with an arrow shot, while the others rushed the foul creatures having caught them by surprise. The fight was quickly over, as the benefit of advantage that was pressed by having many-on-one scenarios was too high. Plus, the kobolds and mastiffs had but 5 HP each, so they went down quickly no matter what. 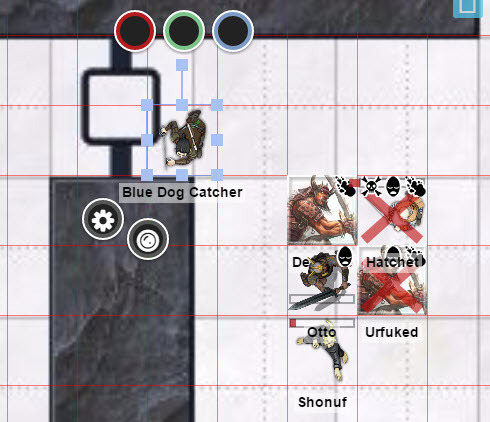 Seeing both dogs and his friend killed in quick succession, the final kobold fled, having failed a morale check, only to be pursued and slain by the monk Sho Anuf. The fountain was the spring that fed the hill fort. And the next room held a trap (detected and avoided) and with some persistent searching, a large treasure chest was found, the rogue picked the lock, and there was much rejoicing. The party then continued west, and ran smack into two hobgoblin captains. 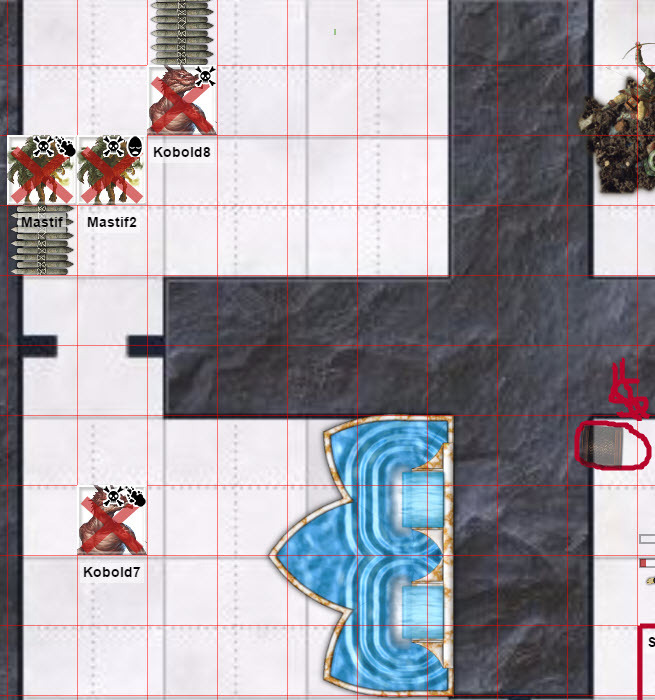 This was a deliberately overmatched fight – two CR 2 hobgoblins against four 1st level characters. The fight went decidedly against the players, with the two greatsword attacks by the captains too-frequently being paired with critical hits (at least twice). With the rules changes in place, this proved fatal to one fighter, and at least incapacitating, if not fatal, to the other. The monk grappled one of the two into the Restrained condition, which allowed a bit of constructive dogpiling and a good sneak attack or two by the rogue. The second was hale and robust, with full stress and no wounds, when the rogue and monk decided to withdraw to the trapped room at a dash, to try and lure the beast under the falling-block trap to his doom. As the captain approached, he hurled a javelin (missed) at the rogue, but was impaled first by the rogue’s arrow, and then by a thrown dart by the monk. This seemingly minor wound turned the tide, as it gave the captain disadvantage on attacks. A few misses later, and some good sneak-attack and other strikes by the fighters, and they stood victorious, but down two companions. We played for about two hours all told, and got through two combats and some trap and treasure searching. Plus a bunch of what if this, what if that rules tweakage discussions. I walked away with no fewer than 20 notes about things to tweak and look at, but the overall approach was quite solid, and I won’t be tweaking that part of it – the stress and hit threshold levels – any more. The basic fighting foundation for mundane combat is solid enough that it’s more than playable. One thing that came up both times, yesterday and today, was grappling. The new rules work great, and add a nuance to this type of fighting that was a great deal of fun to play. This is a more deadly game than RAW 5e, which was, to some extent, the point. There’s a bit more that I want to do to the injury rules that should make them less bookkeeping intensive (death checks work because they’re all you get to do; that sort of repetitive re-roll doesn’t work in the middle of a fight). Armor absorbing damage is the bomb. It’s just more satisfying. I’ve got a lot of work yet to do, and my playtesters will be busy again reading drafts. But I’m ready to start expanding the page count again, and usefully, too!